In 2018 and the coming years quite a few ehealth and mhealth trends will make their way into hospitals and medical practices. Among them will be chatbots, virtual reality, deep & machine learning as well as blockchain technology. Telemedicine and distance health will achieve a breakthrough in 2018. Cleveland Clinic predicts that it will soon be normal for patients to consult their physicians via video conference for instance. Counting your steps or your calories and measuring your heart beat is far from scientific. The data gathered is often flawed, but that’s exactly what is going to change in 2018. Wearables will come out of the fitness center into the science laboratory. Sensor and data quality rises and wearables will play a bigger role when it comes to clinical studies and remote monitoring of patients. In a nutshell: physicians don`t have to rely on what their patients tell them, but on what they can check themselves via their patients’ vital parameters. Chatbots aren’t only the next big thing in marketing, where they are also known as messenger marketing. In the healthcare industry chatbots are gaining ever more influence and they might just be the next big thing. Provided that chatbots communicate more naturally, they could be used for instance before the appointment with a doctor to ask preset consultation questions. Virtual reality is not only en vogue in video games. We have just come across them at the last radiology congress in Leipzig. Experts predict them being used to treat psychological and neurological diseases like anxiety issues, but also strokes or phantom limb pains. Smart glasses and augmented reality could also be used to improve the efficiency and security of sterile surgery rooms and instruments. Due to the big advances in artificial intelligence throughout the last years misdiagnoses can be reduced. Hence, health insurances could save costs by comparing similar diseases and treatments with each other. Thus spotting unnecessary costs in advance. Intelligent algorithms compare in a few minutes many million of patient cases with one another or combine image and text databases with existing diagnoses. On this basis, physicians find adequate treatment for their patients faster or they can review their diagnosis. Patients are able to get a second medical opinion without much effort. Furthermore, physicians have more time for their patients, because they reduce their administration work due to voice recognition systems transmitting reports automatically to their healthcare information system. Physicians and clinics are also able to connect medication to different data sources with the help of big data. This way, they compare different offers from suppliers in order to make the best decision. Graphic processor provider NVIDIA tells on his website and Deep Learning Blog, that he can create superb neuronal networks for medical imaging quite fast while helping with classification, recognition and segmentation. In order to develop better medication against cancer, faster genom analysis and more precise medical imaging, a lot of scientific research with lots of graphical processing power is needed. Primarily blockchain is designed to transmit transaction data securely, transparently and unforgeably. 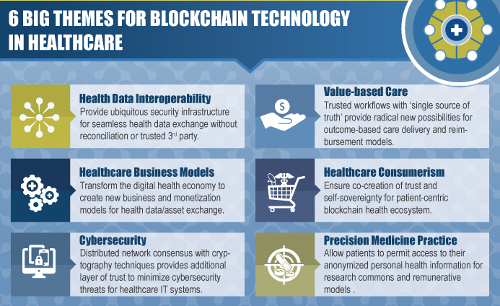 In the healthcare industry this might be used in a variety of ways: higher interoperability of health data; better cyber security; affordable and connected health apps enabling patients to store their data in the healthcare system; new business models through flawless and tamper-proof accounting systems (smart contracts) and unforgeable prescriptions; results-oriented treatment and reimbursement models as well as the opportunity for patients to donate their anonymized health data to science in return for reasonable benefits.